Thus begins the chronicle of our quest to see at least one home of every president of the United States. I began touring president's homes when I was 8 and haven't stopped since. I can't really tell you what the fascination is other than I'm always surprised by how much I learn about U.S. History, how much the President is revered in his hometown (streets, banks, stores, everything named after said president) and the wacky ways that the museum/park have come into owning their piece of history. The funny thing about touring a Presidents' home is how revered that President is in said area. Most areas name everything and anything in the area after the President out of pride, and I suppose a little bit of the American ideal, which capitalizes on a good thing. Come visit a piece of history, a bona fide president's home! Our experience in Tennessee at three different ex-presidents' homes couldn't have been more different. 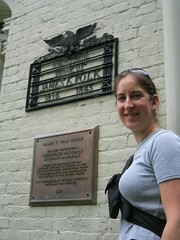 Our first stop was James Knox Polk's house. He was the 11th president, who you may know from the 'They Might Be Giants' song. The estate made a fairly good attempt to basically cobble together every piece of memorabilia that he owned and give it a home in the only structure left that he ever lived in (besides the White House). We found Polk to be much like Coolidge, a good, hard working president, who didn't accomplish anything extraordinary (well, he did expand the U.S. adding, Texas and California), but keeping the country alive. We were 2 of 3 people on the tour and when we ate our lunch in the backyard garden, nary a soul disturbed us. Traveling to "The Hermitage" (You know you're in trouble when the owner actually named the house), home to Andrew Jackson, we were confronted by rows upon rows of parking spaces. It was at this point that we began to realize that we had run into a bit of a Tennessee legend. General Jackson, as he preferred to be called (even during and after his presidency) was a leader to the tips of his toes. Either people hated him or they loved him. As with most legends, the state of Tennessee revered him as one of their most heralded attorneys, war heroes and politicians. So it should come as no surprise that tours of the estate were both pricey and designed to shuttle as many people through the house as fast as possible. The grounds and home are kept in exquisite condition and there's a veritable army of guides, gardeners and assistants. Finally, we visited the home of the most curious of the three Tennessee presidents, Andrew Johnson. He was the only president besides Bill Clinton to have impeachment proceedings brought against him. Not knowing much about his impeachment trial, I was curious to see if the town even acknowledged his existence or merely found him an embarrassment. I couldn't have been more wrong. Greenville revered Andrew Johnson. They have a bank and signs everywhere pointing to his home, museum and tailor shop. This is their main and perhaps only attraction in town. The home is now owned by the National Park Service and delightfully, everything is free, including the guided tour and movie. 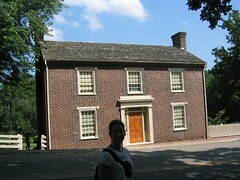 Unlike Jackson's home, but much like Polk's home, it's merely a house. It's been added to and of course there are no bathrooms and the streets have widened, but it exists much as it did over 150 years ago when he lived there. The most interesting part of the entire tour is the section on the impeachment trial. Apparently, Hillary Clinton did not coin the phrase 'right wing conspiracy', she merely borrowed it from Andrew Johnson supporters. Another wronged person, as say the signs, that the Republicans tried to oust.